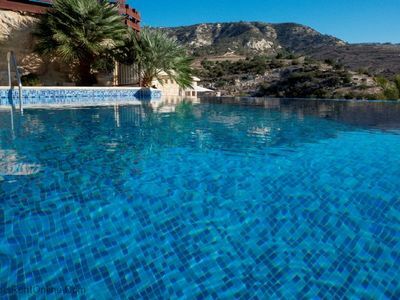 This stunning & luxurious stone built villa is set in the beautiful hills of Peyia, on the southwest coast of Cyprus. With its stylish, modern décor, serene location and breath-taking views, Villa Adara is a haven of tranquillity waiting to be discovered. The villa is the perfect holiday villa for romantic honeymooners, couples, families or groups of up to six. 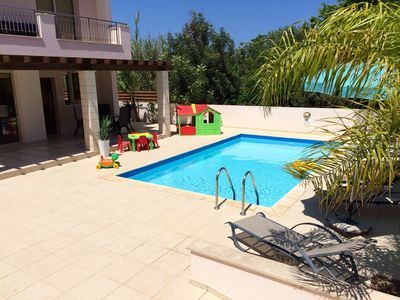 The beautiful, spacious house is set in calm, serene surroundings and is situated only 1 km from the centre of the gorgeous village of Peyia where you can find restaurants, cafés, a pharmacy and grocery stores for your convenience. Villa Adara is an elegant property with a private infinity pool, complete with modern and contemporary amenities. 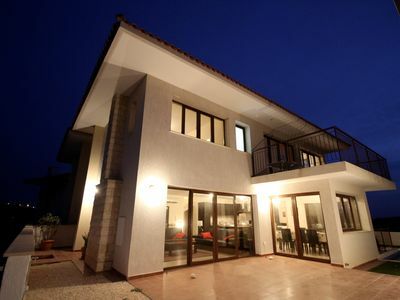 The villa's sophisticated design makes this 3-bedroom gem a very exciting new addition to our Paphos portfolio. The beautiful stone built villa is set in the picturesque mountainside in one of Peyia's most exclusive residential areas. It has 3 bedrooms, 3 bathrooms, (en-suite to master and guest room), sleeping 6 (one or two infants extra could be permitted). Each bed is dressed in luxury Egyptian Cotton with accompanying co-ordinated fabrics. The villa benefits from full air conditioning and fly screens throughout as well as ceiling fans to assist with circulation. The modern conveniences include wireless internet, and smart TV in the lounge (Premium channels including sports and cinema) with Satellite & DVD. The lounge also has a modern wood burner (for those cooler evenings in Nov-April). 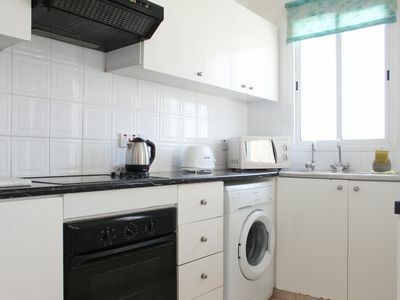 There is also a smart TV in the master bedroom, and the fully equipped kitchen includes washing machine and dishwasher as well as other gadgetry required for home from home cooking. The villa’s rooftop provides seating areas and sun loungers with panoramic views of the mountains, Coral Bay and the sea. The master and guest bedroom balcony also have seating areas where you can relax as the light fades and the stars begin to twinkle above the mountains. The outside dining area nestles under a wooden pergola with woven fabric for shade and privacy and features a modern gas BBQ. The villa’s garden even comes complete with its own fruit trees. 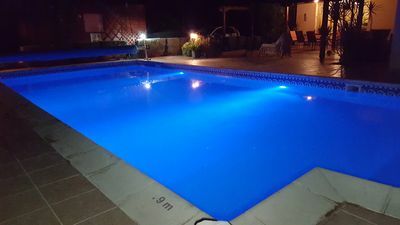 Finally but by no means least, Villa Adara has a private infinity pool (7m x 4m) overlooking the spectacular views of the tumbling valley and mountains (if you are lucky you may spot some Moufflon goats). 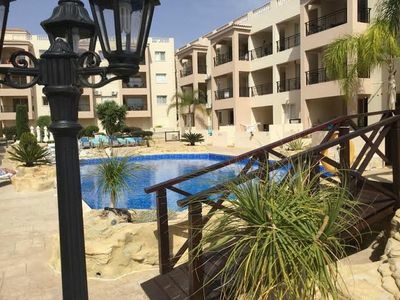 As you walk through the patio doors leading from the outdoor pool area you will find yourself in the open plan kitchen/dining room area. 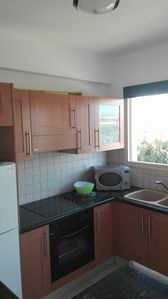 The fully equipped kitchen is clean, fresh and complete with modern appliances including large stainless steel Bosch fridge/freezer, integrated Bosch dishwasher, oven, gas hob and extractor hood, microwave and many other extras. The adjacent dining/breakfast area looks onto the outdoor terrace and the infinity pool, and has a sturdy wooden table and six chairs. The feature archway leading from the dining room takes you into the open lounge. This is a wonderful, open space, full of light, with a second set of patio doors offering views of the surrounding mountains and the valley. Beyond the living room you will come to the first of the three bedrooms. This twin room is bright and fresh and features a full length wardrobe providing plenty of space for all your holiday outfits. The ground floor shower room is next to the twin room and is accessed from the hallway. Moving upstairs you will find the other two bedrooms accessed from a bright airy landing and a large balcony with amazing views. The master suite features a king size bed, mirror, chair and dressing table, large wardrobes, a smart TV, and an en suite bathroom with bath and shower. The bedroom’s French doors lead out to the front balcony. The second bedroom is a double room and like the master it has a mirror, chair and dressing table, large wardrobes, and an en suite shower room. It too has French doors leading out to the balcony. As you walk up the stairs to the villa’s entrance you will be greeted by the stunning ground floor outdoor area. There are four sun loungers with two parasols surrounding the sparkling infinity pool (lit to perfection at night making it a perfect spot for star gazing). The pool is 7m by 4m and features a traditional ceramic water fountain. To the left of the villa down the stone pathway there is a bench surrounded by colourful plants and flowers, making it the perfect reading area with sun or shade depending on time of day. Overlooking the infinity pool there is a large outdoor dining area sheltered by the beautiful, traditional wooden pergola with woven fabric giving it a special Cypriot charm. The pergola affords great privacy from neighbouring villas. To the right of this you will find a modern gas BBQ for alfresco dining. A comfortable basked swing chair completes the area and is perfect for relaxing in by day or by night. Moving upstairs again you will find two outdoor areas. 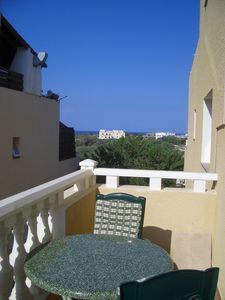 The first is the front facing balcony which you can access from either bedroom. It features a table and two chairs and with spectacular views of the mountains it is the perfect spot for a quiet, perhaps romantic breakfast. Leaving the landing through the back door you will come to the enchanting 'secret garden'. 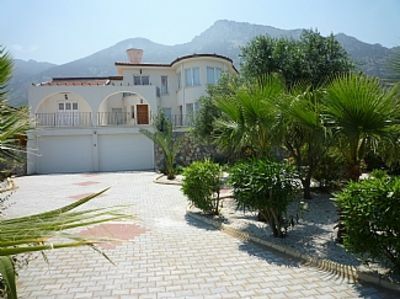 This garden is totally secluded where you will find a small grove of different fruit trees. To the left of the 'secret garden' there is an open spiral staircase meandering up to the spacious rooftop terrace. 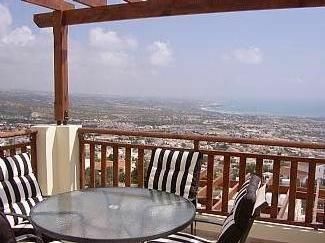 The terrace has breath-taking views for miles around including the Sea near Coral Bay. It has two sun loungers for those who want a sneaky extra hour of sunbathing with a good book, and to the right there is a table seating four, perfect for those sunset cocktails. The rooftop is also a serene spot to relax in the evening when the sun sets. 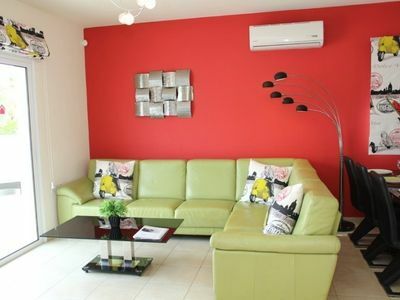 All in all, Villa Adara has everything for the perfect holiday getaway! 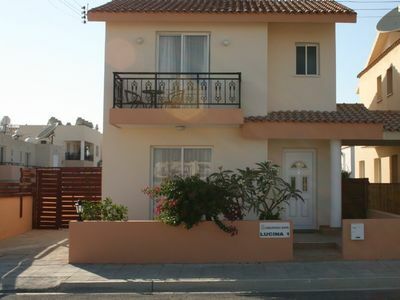 ''The Villa was at least as good, if not better than we had expected from the website description. The size, general layout, facilities & equipment provided were excellent. The villa is in a small quiet cul-de-sac, which in itself is very nice but the real stunner is the views, seriously breath-taking. Provided you don’t mind a couple of short hills the walk into Peyia takes about 10 minutes, just about all of it with some great views of Paphos & Coral bay. Vrisi bar/tavern in Peyia has both a good pint & smashing food. St Georges Tavern up the coast from Coral Bay is a place to enjoy a wide selection of fish dishes. Particularly good for a late lunch. Drive over the tops from Peyia to Polis & Latchi the views are magnificent & the resturants around Latchi harbour all want your business so offer great food & service. ''Great villa. It lived up to the expectations from the pictures. Everything was very clean and it had everything we needed. There were nice touches like the information booklets on how to use the barbecue, satelite tv etc and it was great to see some supplies provided in the fridge already after a long day of travelling. The infinity pool was the highlight and the view overlooking the valley was stunning. The kids equally enjoyed playing in it with the floats and lilos that were provided. The location was perfect for us. 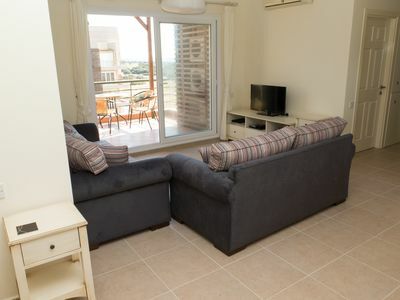 We were keen to be in quiet and peaceful surroundings which the valley certainly provided, but still close enough to drive to restaurants, beaches and other attractions. Had a slight hiccup with Google maps at the very end of the journey but identified which villa it was after a quick check of the directions you had sent. We loved going to Latchi and would definitely recommend doing a boat trip to the blue lagoon. We would also recommend Oniro - the restaurant by the shipwreck - great food and beautiful setting for sun downer drinks. We enjoyed walking round Paphos Harbour as well and there is a good selection of restaurants to choose from. 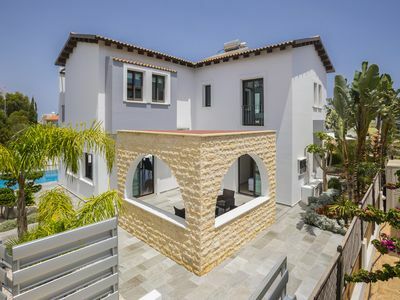 ''Thanks for your e-mail , we really really enjoyed our stay at Villa Adara,the villa was spotlessly clean and had everything you could want for a home from home holiday , the views were absolutely stunning across the mountains and over to paphos from the roof terrace!